CMS Innovations Center announces new Medicare Bundled Payments Initiative. I predict it will be popular. On top of the Medicare Shared Savings Program (the original ACO initiative) and the Pioneer ACO Program, CMS is now adding four more optional approaches for providers to get reimbursed for Medicare services. The new models all involve bundled payments, where a single negotiated payment covers all professional and facility services for a particular type of episode, such as a hip replacement. 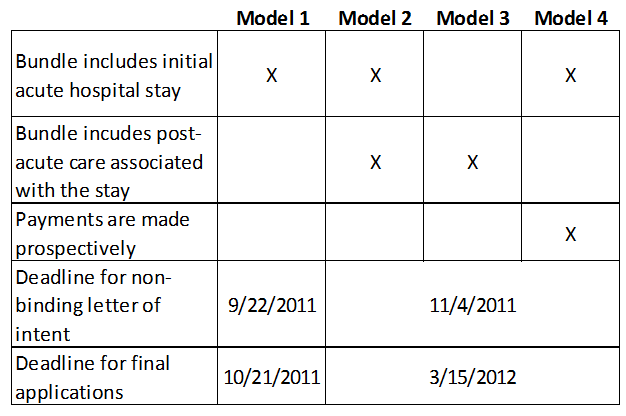 This approach has been shown in a previous Medicare demonstration project and numerous bundled payment initiatives of commercial payers to create an incentive for physicians and hospitals to do a better job coordinating care and reducing the use of potentially unnecessary services during the episode of care, resulting in lower overall cost. The four new models differ in terms of what the bundle includes and whether the payment is made prospectively or retrospectively. Under the program, data about the historical cost for the services associated with the bundle will be provided by CMS. Then the provider will negotiate a discount percentage off of the historical cost, assuring that CMS receives some savings. Then, if providers can reduce their actual cost more than the discount percentage, they get to keep the additional savings. It’s a fair bet that, over time, CMS will ratchet down the bundled payment one way or another. They know the market is heading back in the direction of providers bearing more risk, and this is a way to get their feet wet and establish their capabilities for care coordination, care process transformation, utilization management and the supporting information technology and analytics. I predict that the bundled payment approach will be more popular among health care organizations than the more global ACO approach because is feels more gradual, more controllable, and more understandable. As a result, it is less risky and scary. More information about these bundled payment options are available on the CMS website.